Private Lessons are the perfect environment in which you get the most intensive and individually focused dance training. Working 1:1 with and instructor, you will learn a solid foundation of technique on which to build your dance skill, adding layers of artistic expression and personal creativity as you expand your knowledge base. 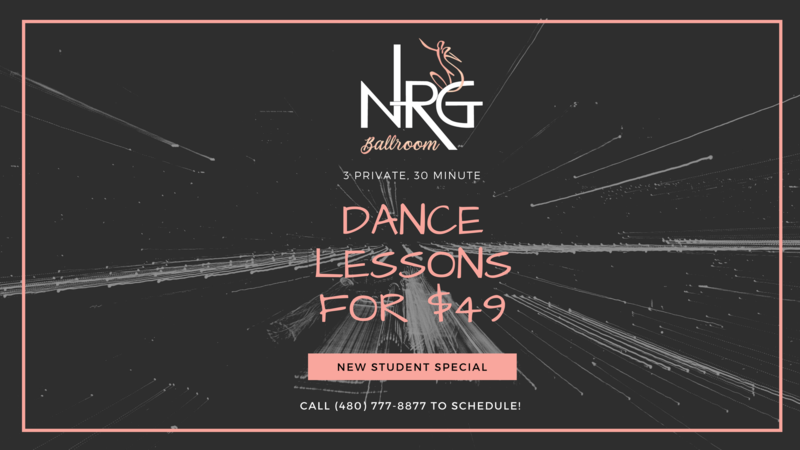 This New Student Introductory Special package is the perfect way to get your feet wet with learning a new dance style, while getting the most “bang for your buck” through personal instruction that is focused on YOU. Open to all levels of dancers, group classes provide an opportunity to learn the basics of a new dance style, or add a new social pattern of steps to your existing knowledge base, while meeting other dancers as you rotate partners throughout the session. Open social dancing is just what it sounds like. Open to the public, no partner required, and social in nature. Many of the group classes are followed by an hour or more of social dancing, where you can practice what you learned in the class, try some new moves of your own, or simply observe and socialize with fellow dancers. All levels share the floor from beginner to advanced. You may even spy a few professionals who come out to have some fun as well. A couple’s first dance can be a very special moment, both for them and for the family and friends who are present for the occasion. Preparing a dance to a song of your choice that has a special meaning allows you to tell the story of your love and commitment in a unique and memorable way. This package is designed for the beginner or intermediate couple who want to learn a variety of social dance styles, creating a new activity you can share beyond your wedding day. This package is designed for couples who have limited time to prepare, but still want to do more than just stand and sway for their wedding dance. In three lessons, our goal will be to provide you with some basic steps and possibly one “trick” or “attention-stealing” move that you can perform to a song of your choice during your first dance as a newly married couple. This package is designed for the beginner or intermediate couples with sufficient time and desire to learn choreography the is created specifically for you. We promise you will make a statement, along with a memorable moment, when you take the floor on your wedding day! Tomorrow’s champions start learning today! This specially designed class provides a fun and interactive learning environment while teaching students the basics to many of today’s most popular Ballroom and Latin dance styles. With a focus on movement, musicality, partnering and etiquette, your child will come away with new skills ad and self-confidence. Fall 2018 classes start on September 6th. Energy of dance is contagious. Let NRG take your event to a new level of excitement with a professional dance performance. Contact us to discuss the details of your event and how we can help make it a memorable experience for all who attend. Jazzercise exercise programs are 60-minute fitness classes incorporating cardio, strength, and stretch moves for a total body workout. The classes combine moves from Yoga, Pilates, jazz dance exercise, hip-hop, and kickboxing. All ages, levels, and sizes welcome to join our dance exercise programs. Want to Increase Range of Motion? Improve Dancing and Posture? Stretch therapy is a complete and cohesive system of innovative manual therapy and movement training that rapidly and radically re-organizes, re-aligns and re-educates the entire body structure. Our certified Fascial Stretch Therapist and Neurokinetic Therapist. Private One-on-One Stretch Sessions and Muscle Testing Sessions are available. After a gently guided warm up connecting us with our center and our breath, we move to music selected to inspire our bodies and minds. No steps to learn, only free-form authentic ecstatic dance. Dress comfortably to move, bring drinking water.